At the invitation of His All-Holiness, Ecumenical Patriarchate Bartholomew and with the blessing of His Beatitude, Metropolitan Tikhon, Archpriest Alexander Rentel, Assistant Professor of Canon Law and the John and Paraskeva Skvir Lecturer in Practical Theology at Saint Vladimir’s Seminary, Yonkers, NY, represented the Orthodox Church in America at the celebration of the Feast of the Apostle Andrew the First-Called, the Ecumenical Patriarchate’s thronal feast, on Monday, November 30, 2015. 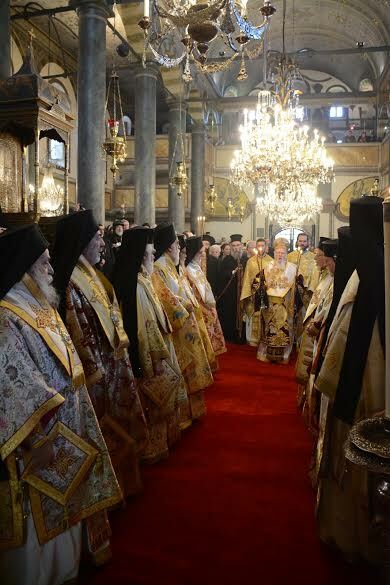 Ecumenical Patriarch Bartholomew presides at festal Liturgy in St. George Patriarchal Cathedral. Father Alexander conveyed to His All-Holiness the personal greetings of Metropolitan Tikhon and expressed gratitude for his gracious invitation, the text of which appears below. We greet Your All-Holiness with much joy on the Feast of All-Praised Apostle Andrew the First-Called, whose heart was enlightened with the perfect brightness of the divinity of Christ. As the thronal celebration of the See of Constantinople, this feast brings us to mindfulness of the service of Your All-Holiness as Archbishop of Constantinople-New Rome and Ecumenical Patriarch. The same light of Christ that enlightened the Holy Apostle Andrew illumines Your All-Holiness in Your apostolic mission and patriarchal ministry. As the Apostle Andrew caught men with the net of his preaching and delivered all nations from the depths of error, so we pray that the See of Constantinople under Your guidance will continue his great and laudable apostolic work for the benefit of all the Holy Orthodox churches and for the well-being of all humanity. We are grateful for the invitation to have Archpriest Alexander Rentel represent us for the liturgical services on this great feast and to share with Your All-Holiness our sincere best wishes for a grace-filled celebration.